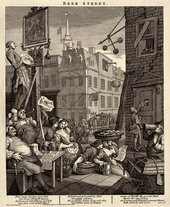 Hogarth's illustration of the evils of gin-drinking was published as a pair with ‘Beer Street’, as part of a campaign against the uncontrolled production and sale of cheap gin. It culminated in the Gin Act of 1751, through which the number of gin shops was greatly reduced. The original copperplates for both prints are now in the Metropolitan Museum, New York, and the drawings in the Pierpont Morgan Library (Oppé 1948, pl.74). Another drawing for ‘Gin Lane’, dubiously attributed to Hogarth, is in the Huntington Art Gallery, Huth Collection. No.III is, according to Paulson, the fourth state of the engraving.